Lovely Pop Mahjong JangJang Shimasho © 1996 Visco. Lovely Pop Mahjong JangJang Shimasho is a strip mahjong game with extensively animated strip sequences. 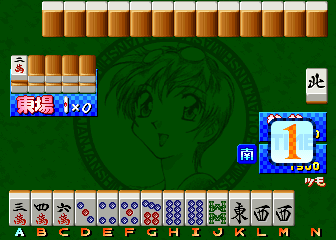 Mahjong matches are played against the members of an all female pop-band called 'VisKiss'. After defeating an opponent, the player is given the chance to play a mini-game to gain more points. Points can be spent at an item shop to buy items to help the player cheat in following rounds. Released in September 1996 in Japan only. The title of this game translates from Japanese as 'Let's Play Lovely Pop Mahjong Jong Jong'.